The Karelian Bear Dog breed is a member of the Spitz family, this breed emerged in Finland and is regarded as a national treasure there due to the fact that they will hunt any type of animal in any terrain and weather. The dog provides protection against a bear because of which it has earned the name “Karelian Bear Dog”. Because of its quick reflexes, aggression and fearlessness it is also used by huntsmen to hunt wild boars, moose, deer, elk, wolf etc. The Karelian Bear dog have an attractive, as well as distinctive appearance and are of medium size, strong and energetic. They are dignified, courageous and bold. The Karelian Bear Dog has a double coated weather resistant coat. The outer coat is linear, rough and of medium length whereas the under coat is thick and soft. The Karelian Bear Dog breed shed hair and thus should be combed and brushed on a regular basis. Bathing should be done when needed and nails should be maintained regularly. 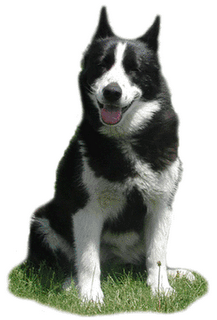 The Karelian Bear Dog are aggressive dogs and must be trained strictly, justly, respectfully and constantly at a early age to ensure obedience. The dog would not obey any harsh methods so an inexperienced or a first time dog owners must avoid buying Karelian Bear Dog as it will create problems for them to deal with it. It should be kept in mind that Karelian is not solely a family dog but will get along with the children and animals other than dogs they have been raised with. It is not advisable to keep them in an apartment because they need exercise and stimulation which if they don’t get can lead to destruction. Therefore it must be left in a securely fenced setting to allow it some leisure space. While in public they must be leashed properly. Despite being aggressive towards dogs and strangers, the good thing is that they are very protective of their belongings and are devoted, brainy, sensitive, independent, robust, decisive and patient. Due to Karelian Bear Dogs being a rare breed, there is no known health diseases associated with them and they live for 10-12 years.